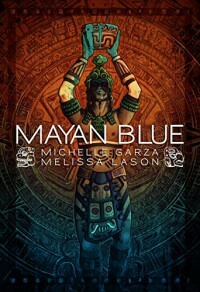 Michelle Garza and Melissa Lason are described as "The Sisters of Slaughter" and Mayan Blue is their debut. And a confused debut it is. Four students and their assistant professor head for the mountains of Georgia where they are to meet up with their professor who feels he's made a great discovery that will change the way history books are written. Once near the rendezvous point, all hell breaks loose. In what they think is the professor crying out for help, Wes and Alissa go off to find him. What they discover an open doorway to a Mayan underworld located deep within a cave inside the mountain. Mayans in Georgia? I like the idea. Unfortunately, that's about as good as it gets. 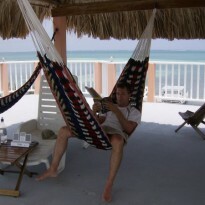 Mayan Blue had some promise. The premise of a Mayan underworld in Georgia had lots of possibilities. Instead, it ended up being one long chase scene where way too little happens. The beginning of the story starts out as a B-horror movie style story. Annoying cannon fodder characters that scream I'm going to be killed before the story even gets going. Then it opens up into the Mayan underworld with good shapeshifting characters. Then the last 1/2 to 1/3 ends up being a murky chase scene where characters are introduced for no apparent reason adding nothing to the story. Our heroes get injured so many times that you start wondering why they haven't dropped long ago from blood loss. Too little character and plot development dampens what could've been a great story. You can see the talent is there. They simply need to focus on tightening up the story, spending more time on plot.